Recently, I started capturing screen shots and taking pictures of anything related to design and user experience. Some are in desperate need of redesign while others impressed me with their usability and phenomenal experience. The more I learn and understand UX, the more I notice it in my everyday life. I’m starting a new monthly segment where I share ten designs and discuss how I felt about them. If they display bad UX, then I’ll make personal recommendations as to how they can be improved. I will also highlight great UX that impressed me and deserves to be applauded. I forgot where I captured this from but I appreciate how the guidelines are explicitly listed and then checked off as I’m typing a password. 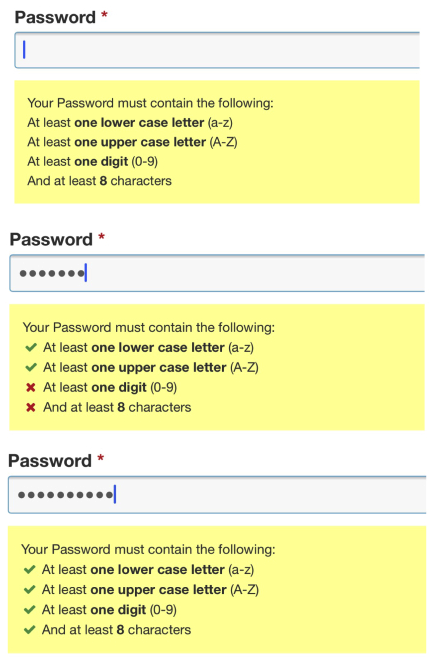 Most other websites provide guidelines and make you enter a password and then say if you’re missing any of them after the form has been submitted. However, I like that this one was in real-time and that I didn’t need to submit the form before I knew if I was missing any of the guidelines. 2. United’s desktop site on mobile? I needed to purchase a roundtrip flight from New York to Miami. Knowing that United often has good deals, I decided to go to their main page on my phone and this is what showed up. Alright, this isn’t too bad for an iPhone 6 Plus user like myself but on smaller phones, this would be a complete nightmare. 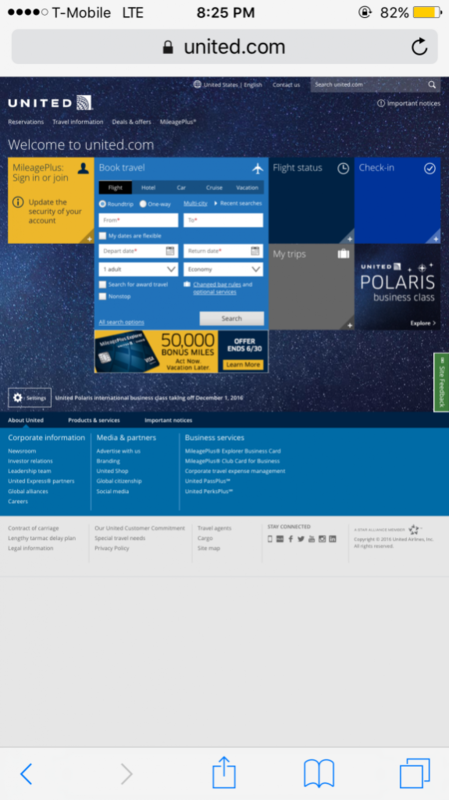 Is this the way United’s mobile site is supposed to be? Or have they just not gotten around to designing a mobile version of their site? Even if I’m using the browser, they should utilize responsive design and match the home page to the device I’m using it through. I recently made my first purchase with Glossier. 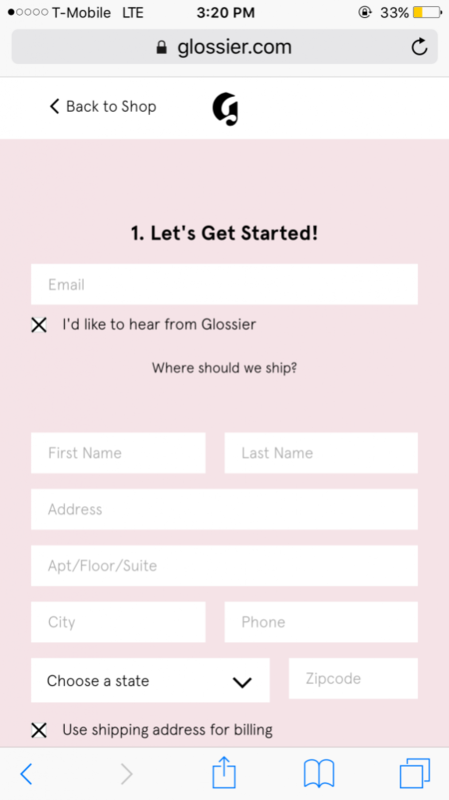 For the most part, Glossier’s mobile site and purchasing experience was fantastic. The only thing that stumped me and mildly distracted me was when I filled this form and noticed that they use X marks to indicate “yes.” To me, this felt a bit counterintuitive and wished they would use check marks or some other indication that was more widely accepted as “yes” rather than an X. This is not a huge deal but it’s slightly distracting. I fell in love with an item from Smythson and decided to purchase it when it went on sale. I put the item in my cart, started checking out and never finished because I got distracted and forgot. 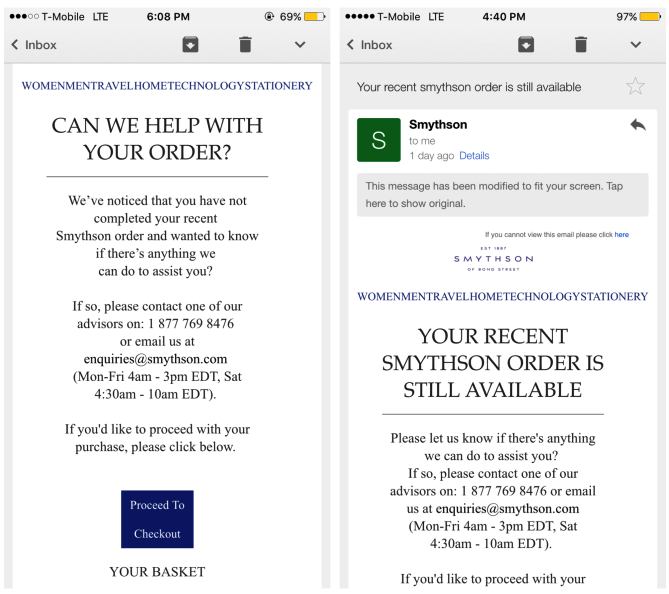 However, Smythson kindly reminded me on two occasions that my item was still in my cart and that I should finish checking out. I know many companies already do this but what I liked about this one in particular was the gentle language. It wasn’t like “come back to our website and finish ordering.” Instead, they asked if I need help with the order and that my item is still available. I was looking to cut clutter in my inbox so I decided to unsubscribe from these updates. When I clicked “unsubscribe” in the email, I was led to this page. They wanted to keep my email subscribed to continue receiving updates and other notifications. I understand that a business’ best interests comes first but I almost felt like they are taking advantage of the human intuition. 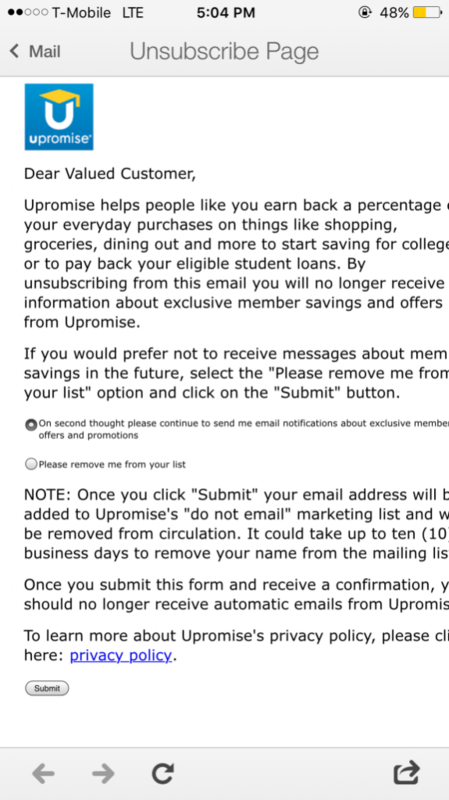 Most other unsubscribing pages set their default to “remove me from the list,” which is what it should be. However, this one does the opposite and deceives the user. If I didn’t read carefully, I would have clicked submit and remained subscribed to their newsletter. This inconsistency and incorrect grammar is distracting. 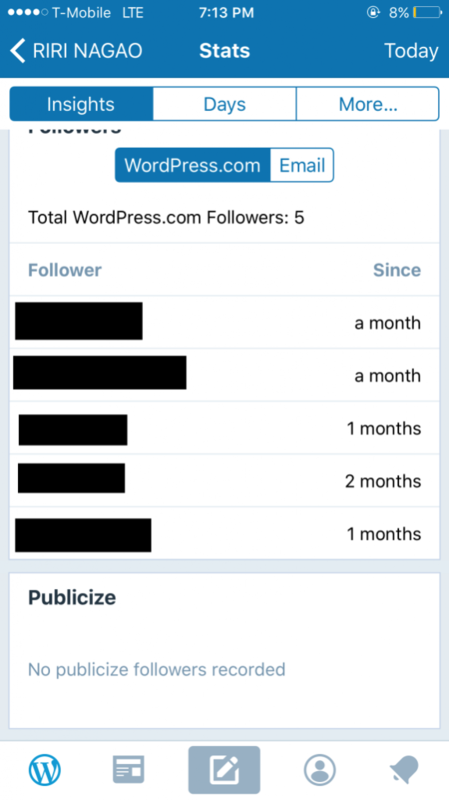 I love WordPress and am using them to host this blog. However, this has been driving me nuts. I see “a month” and “1 months,” thinking that they should decide on one phrase. And when they decide on a phrase, they need to make sure it’s “1 month” because it’s a singular noun. I’ve noticed that iMessage has been smart about their recommendation when I misspell words. Clearly, the language I’m using is English (USA) but somehow, my phone recognized that I use words from Japanese and romanize it. 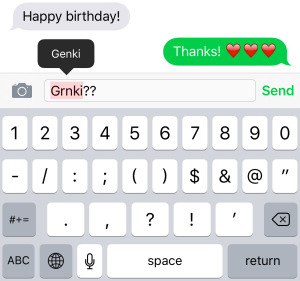 In this example, you see the correction to “Genki?” which means “How are you?” in Japanese. I’ve also seen my iMessage correct “arigato” (thank you) and “matane” (see you later). I’m impressed with how smart my phone/iMessage app is. Good job! I love the LinkedIn app. I would say that I use this platform the most for connecting with professionals, writing to friends about my career transition and looking for relevant content in my area of interest. However, dearest LinkedIn, please make your messaging feature a more pleasurable tool to use! I have connections from all over the world and often use the messaging feature like email. I would like for you to automatically save drafts of messages I start and allow me to go on another device and finish it. Please make this happen so I am not discouraged for writing substantial messages to my connections. Since I’m trying to eliminate inbox clutter, I decided to unsubscribe. All the emails I got were in English and so I assumed I would be able to unsubscribe successfully. I was wrong. It didn’t even cross my mind that their subscription page would be in another language! I already know Spanish so this isn’t a huge deal but imagine what this would be like for someone who doesn’t. 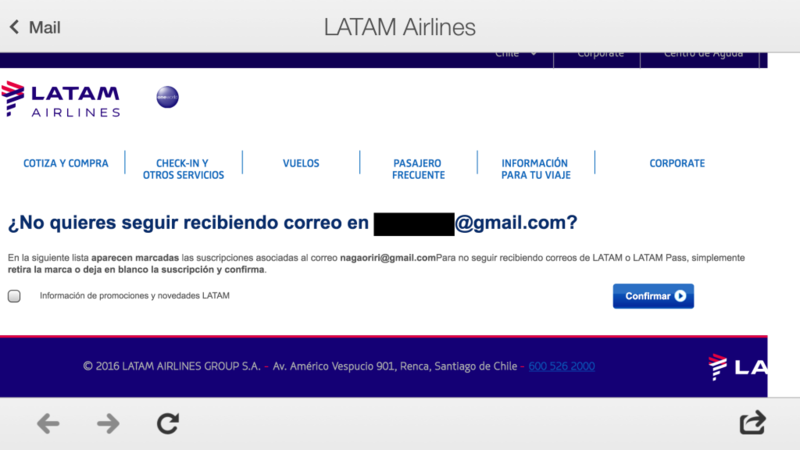 I understand that LATAM is a Chilean airline but if you want global customers, then please make sure that a simple unsubscribe page is in English for your US-based clients. 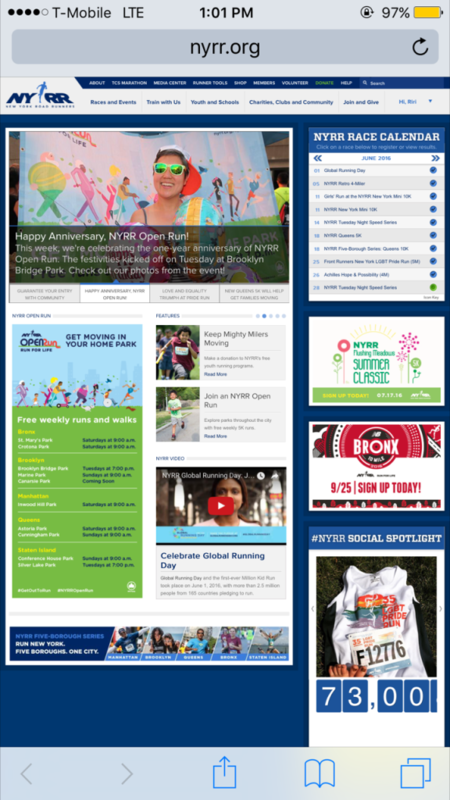 As you know, I’m currently an active New York Road Runners (NYRR) member because I want to get back into the habit of running. This summer, I’m participating in a few races and have noticed the various changes in the experience of signing up to the actual race day and am quite pleased with how far they have come. However, I’m surprised that in 2016, they do not yet have a mobile app that makes it easier for active runners to pull up their QR codes for when we pick up our racing bibs or a notification stating that the results are up. I also think that a mobile app would be great so I can seamlessly register for races. Design comes in many shapes, forms and experiences. As an aspiring UX researcher, I genuinely appreciate great user experiences and am thankful for the team behind a product or the company the made it phenomenal. Evaluating the UX of products and companies that I interact with on a daily basis is a great exercise for me to learn more about designing for experience. I’m looking forward to writing more articles in this segment. Check back next month to see what I list here.